What’s the most impressive part of a 90’ custom sportfish project with no expense spared to build it with cutting edge technologies and the highest-end appointments? Well, everything—but that might be about all we can tell you right now. That’s because the Jarrett Bay and Bluewater teams are bound to secrecy when it comes to some of the most exciting innovations and features going into this massive 90-foot hull. However, they can attest to the overwhelming scope and level of development currently taking place. Walking along the full length of Project Ireland with Bluewater salesman John D Riggs takes almost half a minute, and in doing so you’re passing by seas of hidden numbers… a 465 square foot salon level and 450 square foot bridge. 140’ of toe rail. Nearly 100 overhead lighting fixtures. Those are the little numbers. They pale in comparison to the tremendous amount of man hours invested into research, development and fabrication thus far. 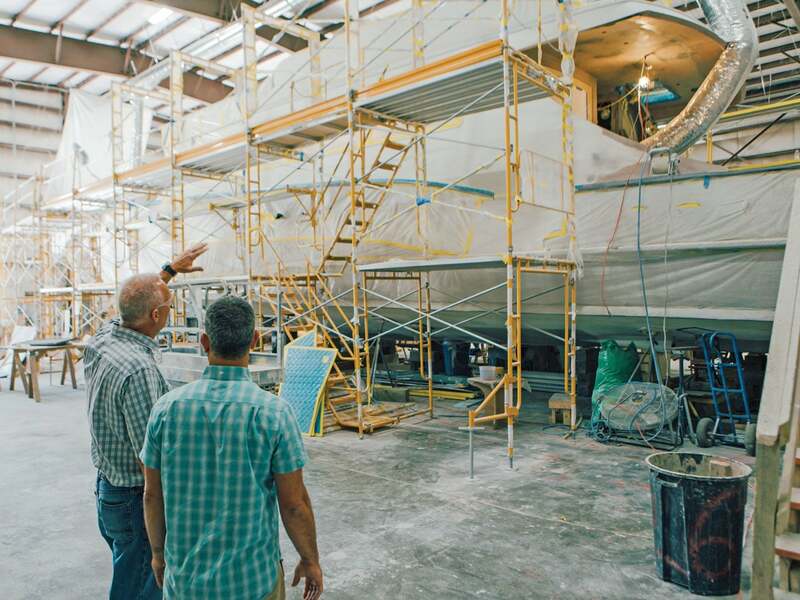 Project Ireland’s owner has a relentless interest in the engineering process and also in ensuring that the 90’ launches as the most efficient, high performing, and safest custom sportfish boat ever built by man. The composition of every part has been closely examined by a team of six engineers, including the three already in-house at Jarrett Bay. Painstaking attention has been given to material science and propulsion physics, including multiple tank tests performed at the MARIN Institute in the Netherlands. Jarrett Bay President, Randy Ramsey explains, “A massive amount of testing has been done. 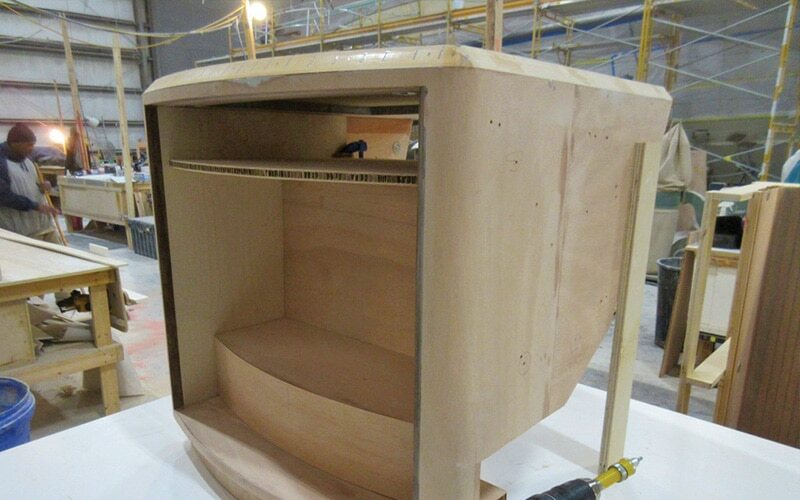 We are using materials in places that you wouldn’t normally see in a sportfish—custom or production. First off were the carbon fiber stringers and bulkheads.” He goes on to explain the cabin, foredeck, salon floor, mezzanine, top deck, bridge, rudders and many other parts have been upgraded to a proprietary carbon fiber lay-up developed specifically by the Project Ireland engineering team. But the use of ultra-modern, lightweight materials doesn’t stop with carbon fiber. Titanium is being used in several large applications, including the massive 30-foot propeller shafts, which saves over a thousand pounds over conventional stainless steel shafts. Riggs adds that they’ve drawn on several weight-saving and efficiency ideas originally developed for aeronautical production. He mentions the unique solid-state counters that will be going in and then points to the marble flooring for the master stateroom, “You’d think that would be heavy, but the tiles have been routed out to be very thin and backed with aluminum. Every convention has been challenged in the name of efficiency, performance and safety. “This is how it’s done in luxury aircraft, like a Gulfstream.” No detail is being overlooked when it comes to saving weight and Riggs admits that even the toilets will be fashioned of carbon fiber! Ramsey and his construction team have discovered many new advantages, but it does come at a price beyond the material expense. He explains, “It does add to the construction process, vacuum bagging and infusing parts at every stage, insulating metals… it takes more planning and did come with a learning curve.” The silver lining for Jarrett Bay is that each day they face and overcome a new challenge, they are improving their boats for the better. “Each boat we build is better than the last, but so much testing and innovation has gone into this one in particular. We’ve found a few improvements to our hull form and running gear that can translate to all our future builds,” adds Ramsey. 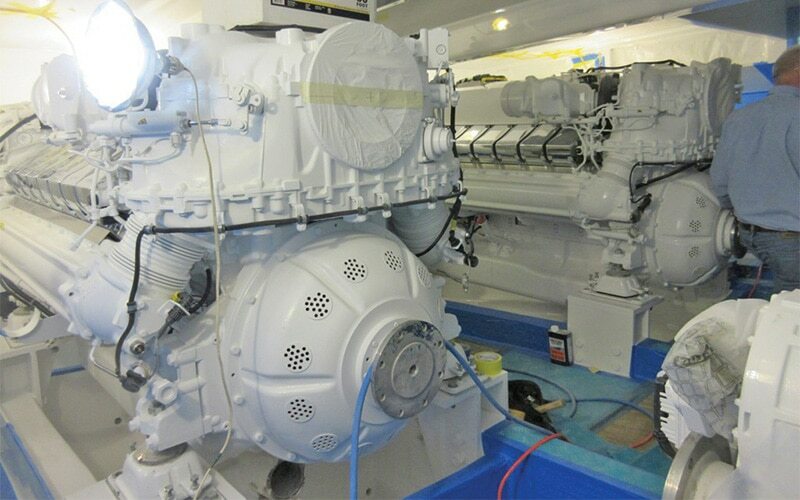 And if another boat owner wants to squeeze every ounce of performance out of their build, they can opt for many of the same space-aged technologies that have been applied throughout Project Ireland—it’s up to them. As the topcoats, high gloss woods, exotic flooring and noise-dampening headliners start to conceal her highly engineered carbon fiber skeleton, Project Ireland’s interior is also shaping up to be second-to-none. Being furnished out with many touches befitting a high-end motoryacht, the award-winning carpenters at Jarrett Bay are ensuring that the quality of craftsmanship is unrivaled. The interior cabinetry has been engineered to ultra-light weights of course, but also for increased longevity in the hardware and finishes. As the first full-beam master to be found on a Jarrett Bay, Riggs explains that the six stateroom layout will also be unique in that it will offer two separate crew quarters. 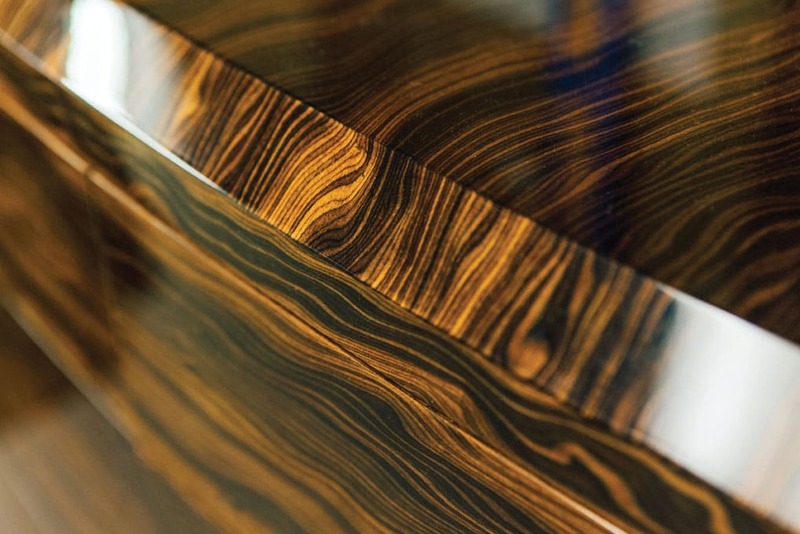 A tour through the company’s varnish shop and adjacent furniture staging area reveals a huge variety of Terra Weave and Black Walnut cabinets advancing through every stage of the finishing process. Everyone stops at a chest of drawers we’re told is destined for the master stateroom. It’s quite obviously something incredible. Riggs exclaims, “it is just so drop-dead beautiful, I don’t know how they even built it,” and Ramsey quickly agrees with him. Impressing and stumping some of the industry’s most experienced yachtsmen is certainly a great testament to the level of effort and artistry going into every inch of Project Ireland. Constructing a yacht of such opulence, scale and innovation has certainly been a massive team effort. Ramsey cites that both Palm Beach Towers and AME (American Marine Electronics) have been extremely involved and helpful in choosing and developing the most lightweight components. The team also thanked Western Branch Diesel’s involvement in the power and propulsion spec’ing, on down to the assistance of Bluewater Supply keeping the vast variety and sheer bulk of construction supplies flowing in a timely manner. Riggs sums it all up, “We have a really great team of professionals. It’s really exciting to see it all coming together, as none of us are aware of any other boat that can compare to this. 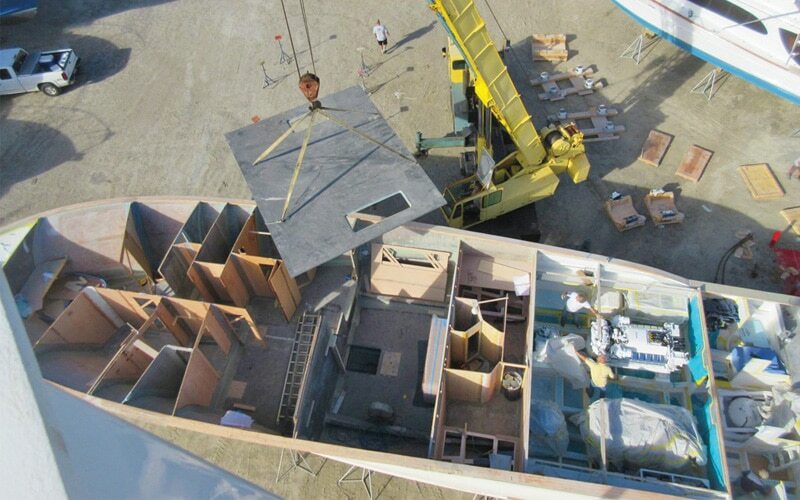 It is a crazy and awesome feeling.” Quickly approaching the finish line on completing one of the most ambitious custom sportfish boats ever built, it’s clear that everyone involved in Project Ireland is excited to see her transition from “a project” to the incomparable sportfishing yacht they’ve been engineering all this time.